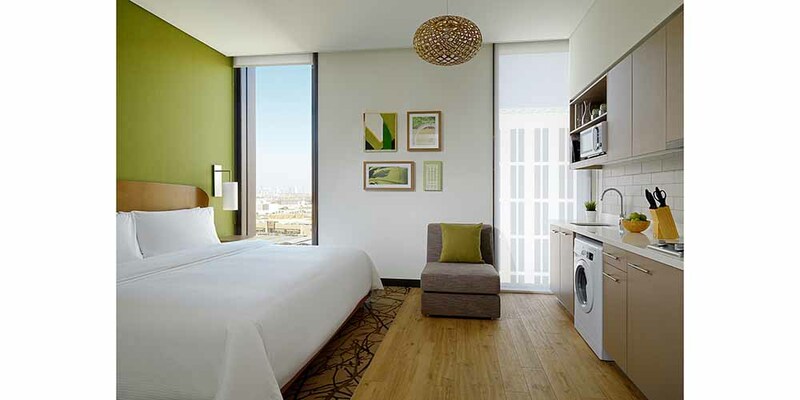 DUBAI, UAE, 2018-May-03 — /Travel PR News/ — Marriott International today announced the debut of Element Hotels in the Middle East and Africa with the opening of Element Me’aisam in Dubai (United Arab Emirates). Owned and developed by Dubai Properties, Element Me’aisam presents a fresh, appealing concept for short and long stays in the city with its eco-conscious ethos and innovative programming. Designed for today’s healthy, active traveller, Element continues to redefine the longer stay experience with its nature-inspired design philosophy that is clean, modern and bright. Certified as a LEED related building, Element Me’aisam was built green from the ground up and adopts natural light, open spaces and healthier lifestyle options. The property features 168 light-filled studios and one-bedroom suites with a fluid design, fully-equipped kitchens, spa-inspired bathrooms and signature Heavenly® Beds. Rooms at Element Me’aisam are equipped with SPG Keyless, the industry’s first truly mobile check-in system where guests can utilise their mobile phones as room keys. For more information visit www.elementmeaisamdubai.com. Element Hotels, part of Marriott International, Inc., defies convention through its stylish and sustainable design. The brand, which draws inspiration from its sister brand, Westin, offers longer stay comfort that empowers guests to ‘Stay in their Element’ through signature amenities including its complimentary healthy Rise breakfast and Relax evening reception, saline swimming pools, spacious fitness centers, Bikes to Borrow program and electric vehicle charging stations. Element made history in 2008 as the only major hotel brand to pursue LEED certification for high-performance buildings brand-wide. Element is proud to participate in the industry’s award-winning loyalty program, Starwood Preferred Guest®. Members can now link accounts with Marriott Rewards®, which includes The Ritz-Carlton Rewards® at members.marriott.com for instant elite status matching and unlimited points transfer. Visit www.ElementHotels.com or connect on Facebook and Instagram. This entry was posted in Hospitality, Hotels, Travel, Travel & Environment, Travel Management, Travel Services, Travelers and tagged Alex Kyriakidis, Dubai, Dubai Properties, Element Me’aisam, Marriott International, Stuart Birkwood. Bookmark the permalink.